We need £10 an hour now! Ed Miliband has pledged that Labour will increase the minimum wage to £8 an hour. But you'll have to wait till 2020! Even as they announce the proposed increase, weasel words about "flexibility" in the event of an economic downturn are included. In other words - maybe we'll increase the minimum wage and maybe we won't. Even if it is implemented, this measure does not begin to tackle the blight of poverty pay in food bank Britain. A £1.50 an hour increase over six years is 25p each year, or around a tenner a week if you can get 40 hours. This is nowhere near enough to match rising prices. For those who cannot get enough hours, particularly if they are on zero-hour contracts, the situation is even worse. As it stands, the minimum wage is so derisory that many workers have to supplement their wages with benefits. Benefits are not being uprated with inflation, so low paid workers' living standards will continue to fall. Moreover, as work income rises, benefits are withdrawn at a sharp rate - so many workers could end up keeping only a fraction of the increase. The minimum wage is also full of loopholes, with lower rates for under 20 and under 18 year olds. The apprentice rate is £2.73! These exceptions must be abolished. The Socialist Party and bakers' union BFAWU have been campaigning for a £10 an hour minimum wage right now - because the rent won't wait. 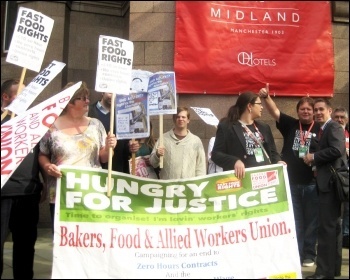 As a result of a bakers' union motion, the Trades Union Congress (TUC) adopted the £10 demand at its recent conference. However, we need to keep the pressure up for the TUC to really fight for £10 an hour. This means co-ordinated strike action - not just lip service. In Seattle, our co-thinkers in Socialist Alternative have led a successful campaign of workers and socialists to achieve a $15 minimum wage - more than double the federal rate. Even the pro-business Democratic Party in the city was forced to concede to pressure from below. A changing point for the "15 Now" movement was the election of Socialist Alternative member Kshama Sawant to the city council. Sawant played a key role in the campaign's historic victory, providing a glimpse of what is possible when we elect a genuine voice for working class people. In Britain, Labour's pathetic pledge shows yet again it doesn't play this role. Trade unions need to break with Labour. We need a new mass workers' party - a genuine challenge to the cuts consensus. The Trade Unionist and Socialist Coalition (TUSC), which includes the Socialist Party and transport union RMT, stood 560 candidates in this year's local elections as a step towards such a party. We will be standing on an even bigger scale in 2015. Strike together. Stand for TUSC. 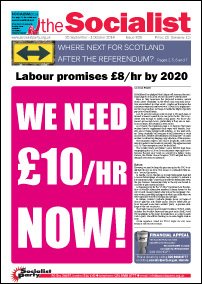 Fight for £10 now. Because the rent won't wait!